Last year, 2018, Kenyan athletes set three world records. Eliud Kipchoge set the marathon world record, Beatrice Chepkoech the women 3000m steeplechase and Abraham Kiptum, the half marathon record. At the Valencia half marathon, Abraham Kiptum set a new world record of 58:18 for the half marathon in a way that no one was expecting it. Not even Kiptum himself expected to run it. All he wanted was to better his personal best of 59:09, which was set on September 16 at the Copenhagen Half Marathon. 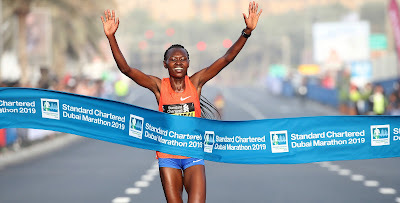 "Obviously I knew I was in good shape because I set a PB last month in Copenhagen, but I was eager to run in Valencia because it's one of the flattest circuits I've ever run, and I was confident of improving on my best," Kiptum told reporters after the race. Zersenay Tadese's record of 58:23 had been hard to break and had stood since 2010. It needed a special run to achieve that mark and Kiptum was the one to do it in some almost unbelievable time splits throughout the race. 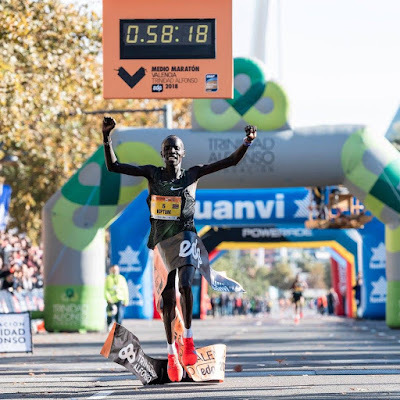 The leading pack crossed the 5km point in 13:56 and then the 10km mark in 28:02 before Kiptum broke away to cross the 15km mark in 41:38, the 20km point in 55:18 and finally crossing the finish line in the amazing new world record time of 58:19. The average paces for the consecutive 5km distances were 2:47, 2:49, 2:43 and 2:43. With this amazing achievement, Kiptum changed the general perception that for runners to run fast times, they only need to focus on a few races in a year. By May last year, Kiptum had already won a high profile marathons; the Daegu Marathon in April. In between that time, Kiptum had done many other low profile races including winning a 10,000m local track race in Eldoret, among others. He had also won a number of local road races in Kenya including the Kabarak half marathon and the Safaricom Iten 10km before setting a new personal best time of 59:09 in Copenhagen last month. Back in Kenya again, he was second to Rhonex Kipruto at the Ndalat Gaa Cross country event in the senior men's race just two weeks before heading to Valencia. More interesting is that, despite the world record run, Kiptum is still planning on running another marathon (the Abu Dhabi Marathon on 7th December) before the end of the year, and it won't be surprising to see him doing a couple more local races in Kenya before that! For now, many runners will be seeking to better their personal best times at the Valencia half marathon given that Joyciline Jepkosgei set the women's half marathon world record last year of 1:04:51 on the same course.